Certified International Coaching Community Coaching Trainer. 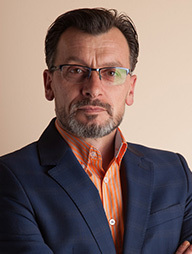 Creator and owner of the first, and the biggest coaching school in Poland with international certification (ICC). Initiator and creator of the Coaching Chamber in Poland. Member of Grandparenting Council in Polish Coaching Chamber. Accredited Supervisor and Coach of the Polish Coaching Chamber. Master of art NLP. Executive coach, trainer, mentor, business advisor. Lecturer of Coaching in Łódź University of Technology. He has been learning from many teachers on the world of coaching, among these; Systemic Thinking – J. O’Connor, I.Rudzinska, Executive and Team Coaching – J. O’Connor, A. Lages-O’Connor, The Heroe’s Journey and Generative Change – S. Gilligan, Flower of Life – T. de Winter, Zen of Coaching – R. Bolstad, Provocative Coaching – N. Hoeffner. This is only a small part of his many years of study. He is an author of many articles about coaching and a book “Contemporary mythology of coaching. 70 real answers to 70 essential questions”. On a daily basis he is President of the Board in Values Team. Besides coaching, he spreads the idea of building values-based organizations and talking about values. Advisor, coach and mentor for people in management positions in many big international companies.